I am absolutely thrilled to bring you the news that Becky at 3princessesand1dude and I have joined forces and will be together hosting a new linky called toddlerapprovedtuesday. Link up with your recipes, activities, toys, games...anything that you find your toddlers love! We would absolutely love it if you would join us, linking will open every Tuesday through to Thursdays and give us a good few days to see what your little ones have approved! We will share your posts on Twitter (make sure you follow me (@3princess_1dude and Leandra @larabeeuk) and every week we will each pick our fave two for a #ToddlerAprrovedTuesday Showcase! 1. Link 1 post per week, Remember to paste the #ToddlerApprovedTuesday badge on each post you would like to link up (code below – paste it into the HTML option of your blogging platform). 3. 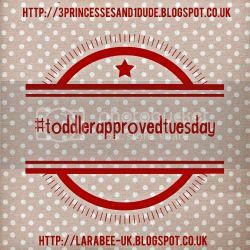 OPTIONAL: Share your post and the linky party (using the hashtag #ToddlerApprovedTuesday) on your social media, Becky and I will retweet all your posts via Twitter (make sure you mention us in your tweets @3princess_1dude/@larabeeuk) and also share on our #ToddlerApprovedTuesday Pinterest board.